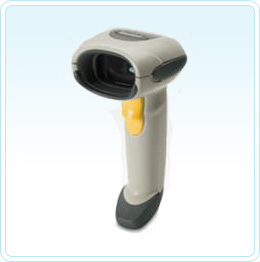 The Motorola LS4208 hand-held laser scanner supersedes the very popular and extremely reliable LS4004 & LS4008 Series scanners. Slightly bigger than the LS2208 the LS4208 delivers exceptional reading performance over a wide range of barcodes from high density to poorly printed and hard to read barcodes. Its single-circuit board design ensures sturdiness and an ergonomic shape maximises user comfort. Continuous one-pass scanning, an innovative multi-line rastering scan pattern, a wide working range and superior motion tolerance make data capture easy, even for novices. Withstands multiple drops to concrete, minimizing downtime due to accidental drops. Enables presentation scanning, with automatic switching between hands-free and handheld modes. Scanner warranty 5 years (60 months) from the date of shipment. The Liquid Polymer Scan Element includes a limited lifetime warranty. The most popular accessory for the LS4208 is the hands free Intellistand that is stylish and fully adjustable. It holds the LS4208 in the desired position and can be lifted out easily for hand scanning when required. For clients with the older models we still have spare synapse cables and Synapses in stock. These cables include the standard and extended coil cables that attach to a synapse interface.